German metallers Majesty arrive in 2006 with their fourth studio album, Hellforces. Often referred to as simply a Manowar knock-off or "the German Manowar," I would disagree with that blanket assessment on this album. With their second album, Sword & Sorcery, I probably would have been perfectly alright with that classification of Majesty. However, with their last album, Reign in Glory, the band moved away from that very limiting mold. With Hellforces, I think Majesty are continuing and expanding on the sound they delivered on Reign in Glory. Still, this album is a great dose of true metal. It's nothing original or groundbreaking, but it is staying in my listening rotation as it is an excellent album. Just by glancing at the tracklisting, you can instantly see that they lyrics on this album are about as deep as a mud puddle after a spring shower. Of course, if you're a Majesty fan or a fan of this genre in general, you've come to accept that as part of the genre. Personally, I find these type of lyrics entertaining in a humorous sort of way. I don't know if it's intentional on the band's part, but I interpret lyrics like these with a big chuckle just as I would with "non-serious" bands like The Darkness, Lordi, or the fictional Spinal Tap. The prototypical, "We are metal warriors from hell, here to vanquish and destroy those who rise up against us" style lyrics are all over this album. Musically speaking, the album contains a balance between double bass driven power metal anthems and mid paced heavy metal hymns. Actually, the balance of this album is tilted in favor of the mid paced cuts. Hellforces, Heavy Metal Desire, Guardians of the Dragon Grail, and Metal Law 2006 are the fist pounding, double bass driven power anthems of the album. None other than U.D.O. contributes some vocals on Metal Law 2006, in a duet with Tarek Maghary. Guardians of the Dragon Grail is a powerful tune that teeters on Rhapsody territory, minus the movie scores and heavy orchestration. The title track is the other double bass driven power anthem that I'd call a highlight of the album. This is just a great way to lead off an album. An almost Judas Priest like riff backed by a high pitched shriek from Tarek Maghary, and followed a brief shred get things started. I can't help but think of Judas Priest again during the chorus lines, as "Hellllll forces" sounds strikingly similar to that of Jawbreaker. An technically skilled, over the top solo in the middle of the song is another throw back to the screaming guitars of classic, 80's metal. 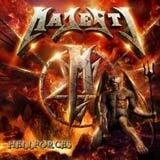 The balance of the album is primarily composed of mid paced hymns dominated by heavy, yet slow riffs ala Manowar. Again, it would be unfair to lump everything into a "similar to Manowar" column, but there still are several similarities. For instance, Dance with a Demon is built upon a slow, but heavy and driving Black Sabbath style riff, while some strong Maiden-esque rhythms kick in during the chorus lines. Another highlight is Like a Raptor, which features a sharp power chord, with a thick rhythm layered on top during the very memorable chorus lines. March for Victory, as the title implies, is a mid paced, triumphant battle hymn that focuses on victorious lyrics and an uplifting, catchy chorus line. Some dual leads guitars are used here to give the song an extra thick sound. Freedom Heart is the obligatory ballad of the album, and it's not bad actually. Some nice soloing and thick harmony vocals are the highlights here. I guess this is the part where the brave metal warrior returns from battle into the loving arms (and bed) of the beautiful dame. Fight Forever is another slow, but heavy track that is dominated by a huge, slicing power chord. Again, this is another battle hymn that uses thick harmony vocals throught, and key change in the middle of the song to give it a building, epic feeling. Sonically, Majesty has put together a near flawless album. The low end of the sound is very strong, giving each song a full, heavy sound. This particularly helps the slow, but driving songs still sound heavy as hell. Each and every track just pounds you to the core, no matter the tempo, and sounds terrific on my home stereo system. The sound quality is contemporary and razor sharp, similar to other well produced German metal bands such as Iron Savior, Paragon, and Grave Digger. Tarek's voice sound great on this album; full bodied, convincing, and even able to reach up for a high shriek on occasion. While I enjoyed some songs more than others on this album, I wouldn't skip any of them. Depending on the individual tastes of each listener, I think most will have their favorite stand out tracks, while still considering the others to be at least good to excellent tracks. Having said that, I can easy that Hellforces is a very consistent album in terms of songwriting. I hear enough variation from song to song that I can listen to this album over and over without getting bored. As I said (and should be plainly obvious), the music of Majesty is nothing original or groundbreaking. However, all I ask is that a band gives me something good. Mission accomplished easily as far as that goes. Hail!